While they were stationed at Hounslow in 1784 the 7th Queen's Own Dragoons were ordered to equip themselves as light dragoons. Helmets replaced the cocked hats, and boots, saddles and belts were to be lighter in weight. Carbines replaced the old short musket and swords were slightly curved instead of straight. The order issuing 'Regulations for the Clothing of the Light Dragoons' was dated April 1784 and stipulated blue coats for men and officers, but an inspection report of 10th June 1785 states that the officers were 'not agreeable to the late Regulation, in a jacket and shell' but that the remainder of the regiment was dressed according to regulations. By May 1786 this had been corrected. Presumably the officers were wearing their old red uniform for the first year at least. Before they moved from Hounslow to Croydon in December 1784 they were reviewed by the King who expressed his approval of their appearance and discipline. So he must have seen the discrepancy between the dress of the officers and the men. Following the events of 1789 the French Revolutionaries attempted to foment rebellion in other European countries, England included, and to this end decided to invade Holland in 1793. England was unprepared when France declared war on her but they sent a light cavalry force to the Low Countries which amounted to 23 squadrons, part of the Duke of York's army. The 7th Light Dragoons provided 2 squadrons (4 Troops) of 108 men per squadron, commanded by Major Osborne. The 7th's light cavalry brigade also included squadrons of the 11th, 15th and 16th Light Dragoons, commanded by Ralph Dundas. They did little in the siege of Valenciennes apart from covering the besieging army. When Nieuport was under threat General Abercromby was sent with a force that included one squadron of the 7th and one of the 15th. They attacked the French at Lannoy, drove them out and pursued them, taking 60 prisoners and suffering minimal casualties. On 17th April 1794 the Allies advanced from Le Cateau towards the French who were in a defensive position on the wooded heights of Bohain and Nouvion which extended for 18 miles. They numbered 36,000 men, in 3 divisions, under Marshal Pichegru. The 7th supported an artillery attack on Premont and Vaux and several actions took place up to the 26th April. On that date the regiment was camped at Le Cateau and their outposts came under attack early in the morning when a thick fog covered the area. As it cleared the enemy column could be seen and the cavalry was sent out to the left to reconnoitre. This included the 7th, 11th LD and 2 squadrons of Austrian Hussars. The French were in some disorder because another column was in retreat and breaking through their formation. The Allied cavalry took advantage of this and pursued the retreating horde across the plain of St Celian. The 7th and 11th charged on and attacked the main body of the French army wreaking havoc and destruction. But their casualties were light; one man and 7 horses killed, 19 men and 6 horses wounded. One eye witness wrote that the '7th and 11th Light Dragoons performed prodigies of valour'. An officer who particularly distinguished himself that day was Lieutenant Terence O'Loughlin who later commanded the Household Cavalry in the Peninsula and went on to become a Lieut-General. 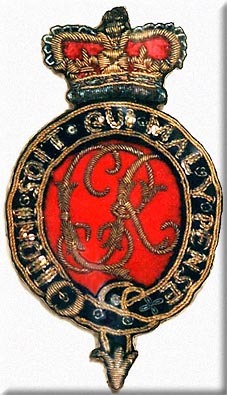 The battle was named as Beaumont and the regiment was eventually awarded the battle honour in 1909. The British were at Tournai on the 3rd May but had to link up with their allies. On 10th May they were in a defensive position between Lamain and Hertain when they were attacked by a column of 30,000 French troops. At one point their right flank became exposed and 16 squadrons of allied cavalry was sent on to the plain of Cysoing to exploit this. They were slowed down by a vast field of cole-seed which was grown in trenches. This gave the enemy time to form squares and prepare to receive a charge. The cavalry had to make 9 separate charges against these formations, but the ground prevented them from coming at speed. The situation became worse when French artillery opened fire from some high ground, but the Duke of York sent in the infantry to support the light dragoons. The French infantry and artillery began to pull back on the village of Willems but the squares were still intact. The Royal Artillery managed to get into place to fire on the enemy and a charge by the Scots Greys managed to break a square. The rest of the cavalry were then able to break the other dispirited squares and force a retreat. British losses were minimal compared with the French casualties. None of the 7th LD were killed in this hard-fought action, and again the battle honour, WILLEMS was not awarded until 1909. The regiment were part of General Abercromby's force which was ordered to capture a fortified position at Mouvaux. The Brigade of Guards attacked the pallisade defenses while the 7th and 15th Light Dragoons detoured around to cut off any retreat by the French. They found themselves halted by chevaux-de-frise which were moved by some of the men. When they rode through they were able to charge the infantry, killing many and capturing 3 guns. The CO, Lieut-Colonel Osborne was captured but later rescued by his men. The situation then became very serious as the other Allied units had failed, leaving Abercroby's men exposed on all sides. They spent a fraught night surrounded by enemy forces and at daybreak attempted to fight their way out towards Roubaix. They suffered under a hail of grape-shot and musket fire, and went through Roubaix and on to Lannoy but the pressure of the enemy attack forced them on further, to Templeuve where they made a stand, and then on to the safety of Tournai. The 7th's casualties included 6 wounded and 15 missing (either killed or taken prisoner). There were many accounts of the light dragoons rescuing men who had been captured by the French under very difficult circumstances. The Allied garrison of Nimeguen was under siege in November but a sortie was made to destroy defensive works raised by the enemy outside the town. These defenses were being built by French soldiers and civilians forced to help. When the Allies attacked 150 of these civilians were killed along with many French troops. Many more retreated and were pursued by the cavalry which took the opportunity to slaughter the fleeing masses. There is some disagreement amongst historians as to whether the 7th LD were present at this siege and sortie, but a detailed list of units made by a Captain Jones in the Historical Journal names the 7th and 15th Light Dragoons as being present. The cavalry went into winter quarters near the River Lech. It was a hard winter and there was much sickness and a shortage of food and clothing. There were still attacks by the enemy and by the middle of January a general retreat was ordered. The retreat to the sea makes sorry reading and many men died of sickness, cold and hunger. The 7th were engaged in covering the retreat and were involved in skirmishes with their French pursuers including a battle at Geulder Malsen on 5th Jan 1795 which was fought on a frozen river. The regiment went through Germany and spent the summer in Westphalia before embarkation for England in November 1795. In 1799 Britain was again required to send troops to Holland, governed by the Batavian Republic which was under the control of France. The proposed landing at the Helder was a joint operation with Russia. The 7th LD were not in the first landing on 27th Aug, but sailed from Ramsgate on 11th Sep and landed at Nieuwe Diep on 15th Sep. The regiment was commanded by Colonel Lord Paget who also commanded the brigade of British light cavalry, made up of the 7th, 11 and 15th Light Dragoons. The campaign is well documented in an account written by Lieutenant and Adjutant John Hunt of the 7th LD. Hunt had great praise for the Royal Horse Artillery that kept up an artillery duel with the French for 2 hours and drove them off, having suffered heavy casualties. French cavalry then attacked the RHA and seized their guns but a counter-attack of the 15th LD led by Lord Paget rescued the artillery and the guns. Hunt's squadron joined in on this charge but from a different direction. Many of the French were killed but the British casualties amongst the Light Dragoons were light. The 7th lost 2 men killed and 11 wounded. Four horses were killed and 24 wounded. Bergen and Egmont had been taken from the French and Alkmaar was now in British and Russian hands. The action on the 6th was precipitated by the advanced posts pushing too far forward and the Russians being anxious to take possession of a hill to their front. The town of Castricium changed hands a few times but a bayonet attack by the French caused the British to flee. Another charge by Lord Paget prevented a massacre of British infantry by the French cavalry, although they were checked by a counter-attack from Dutch hussars. The 7th lost another 2 men in this battle, and 4 wounded. The British and Russians were pushed back to Bakkum and Limmen and the pursuing French inflicted heavy casualties on them. The retreat could not be reversed because the French were able to reinforce their army while the Anglo Russian force had dwindled through death and sickness. 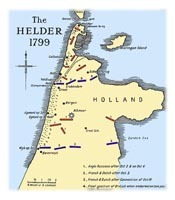 Large areas of the Helder peninsula were flooded by the French to impede the transportation of British supplies, and the weather was getting wetter and colder. The Duke of York decided to discuss terms with the French and remove his army from Holland. Lieutenant Hunt and part of the regiment embarked on the 'Pitt' on the 29th Oct and sailed back to Ramsgate but contrary winds prevented them from reaching that harbour and they had to go on to Yarmouth at which they arrived on the evening of the 31st. They remained at anchor but on the next day there was a severe gale blowing which kept them aboard. Hunt finally got ashore on 2nd Nov and was then offered a sea trip on the same boat to Ramsgate. He declined as 'the discomforts on board and the bad food had quite disgusted me.' As it happened the rest of the men and horses could not be disembarked and the ship had to remain there at anchor until the 7th Nov when the weather finally calmed down.